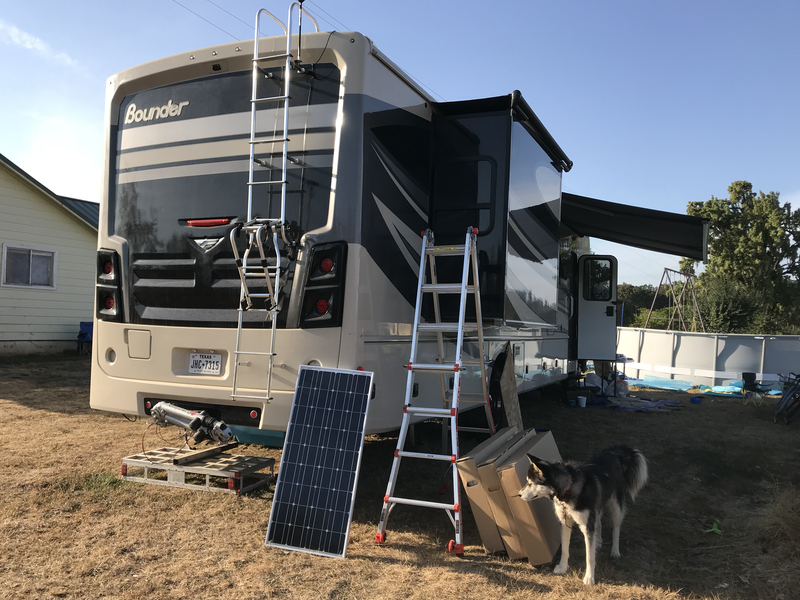 It seems like a rite of passage for full-time RVers to install solar on their RV. We’ve been running two 100watt panels as a portable ground setup, but we wanted something permanent and bigger. 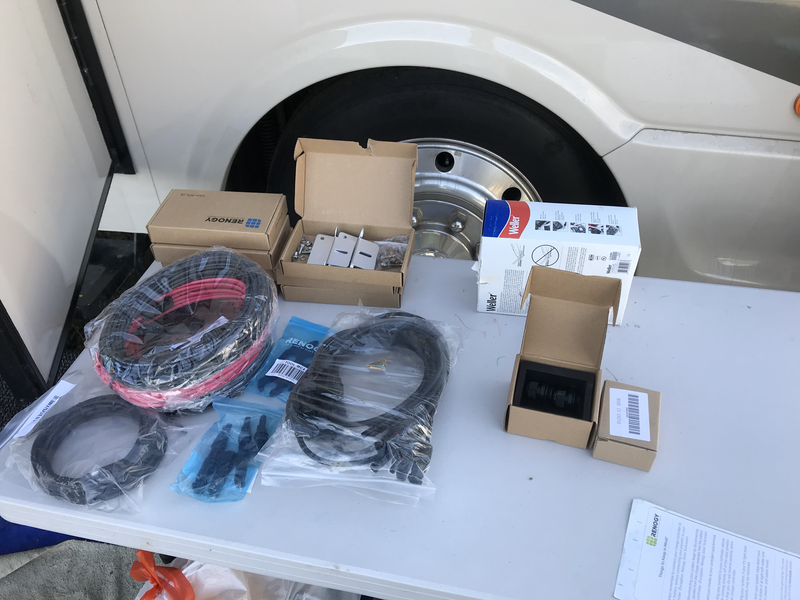 There are so many good articles and videos about doing RV solar installs, so I won’t try to do a comprehensive report. Also, despite my intentions to document each step, I got so engaged in the project I forgot to take pictures. To tilt or not to tilt…No tilt! One decision you have to make during the planning phase is whether to use flat mounted panels or install tiltable brackets. The tilt brackets require you to climb on your roof and set the tilt angle each time you park, although I’ve heard of one person who had motorized tilts on his panels. I decided not to do tilt mounts based on something I read on an online forum. As I write this, the foolishness of relying on random forum opinions is settling in, and I’m wondering if I’ll regret the decision. The poster suggested that rather than installing tilt mounts and having to climb up your roof constantly, just buy an extra panel to offset the inefficiencies of a flat mount. I was sold on that idea. Additionally, we still have our ground panels that we can tilt and angle to our hearts content to get some extra juice, if needed. I already had a charge controller and battery monitoring kit, but I wanted to replace some parts. I wanted to replace my basic, 20amp auto fuses with auto resetting 40 amp versions. I also wanted to swap out the cables running from my charge controller to my battery. Previously, I’d used standard solid core 10AWG cables used for home electrical. I know that stranded cables are better, particularly for automotive uses so I picked up some higher quality, stranded cables to replace my existing wiring. Since we already had a charge controller for our ground solar panels, I didn’t want to purchase another one. That meant I’d size the system based on the charge controller’s rating, which is 40 amps. I already knew how much each panel would generate. On a sunny day, our 2 ground panels generate about 11-13 amps when they are optimally tilted. After some estimating, (er, sophisticated math) I figured each panel would produce around 5 amps max. I already had 2 panels, so I figured I’d get 6 more, brining our potential to about 40 amps (5 * 8). Amazon screwed up my orders, and so I ended up getting an extra panel out of the deal, so we ended up with 7 new panels, 9 total with our existing ground panels. 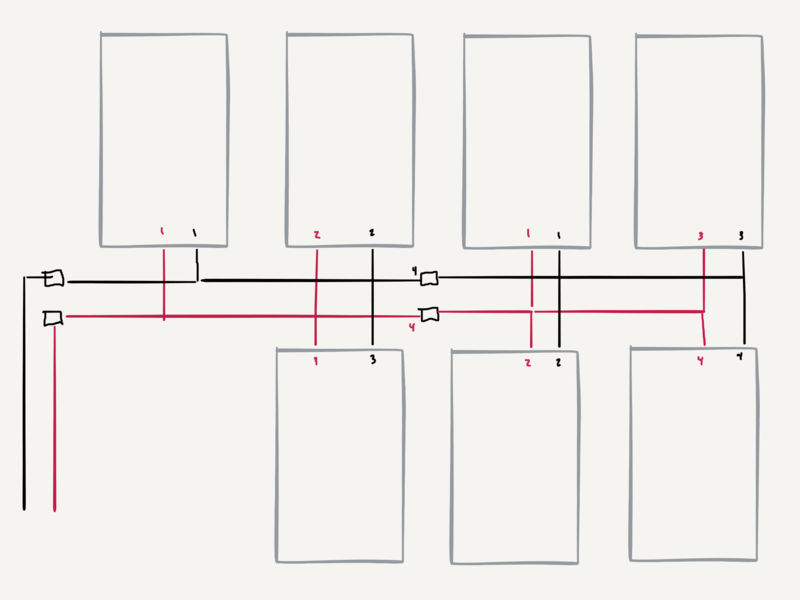 I diagramed my layout and discovered that by buying 2 sets of branch connectors, I could eliminate the need to buy a ton of Y connectors. Boom! I’m guessing I wont get a full 5 amps per panel with them being flat mounted, so I doubt I’ll get a full 35amps with my 7 panels. However, I very well might approach tha number on sunny days, and having 7 panels may eliminate the need to use our ground panels every time we park. Time will tell. So why have ground panels at all? Simple: we like parking in forested areas. 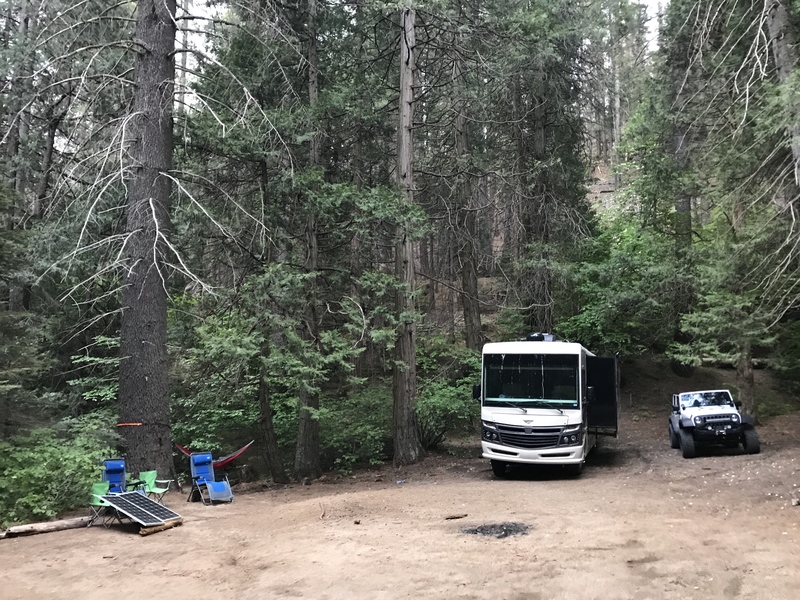 We’ve been able to place the ground panels in full sun while our RV sits comfortably among the trees. 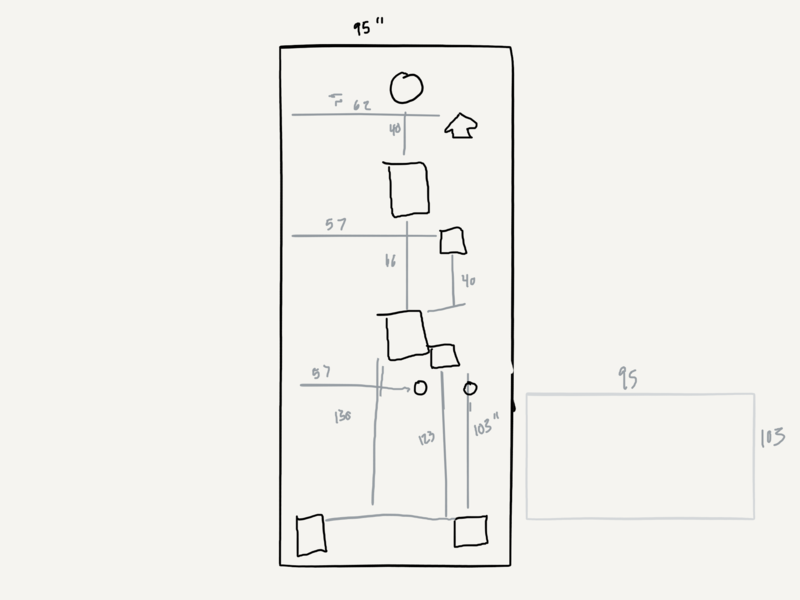 I spent an evening on the roof with a tape measure, getting a bunch of measurements which I drew on my iPad. 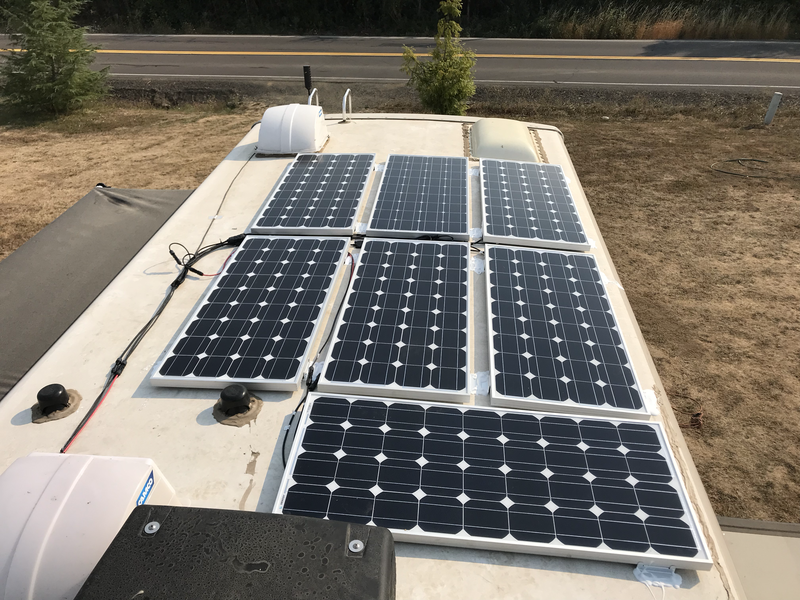 I didn’t want to put the panels in areas where shade from an AC unit or anything else could land on the solar panels, so I decided to group the panels at the rear of the RV. An additional consideration I took into account was position of the panels relative to the slide outs. I anticipate needing to do slideout or awning maintenance at some point, and don’t want to have solar panels in the way when I do that. I was able to keep my panels away from all slide outs and awnings. Once the panels arrived, the first thing I did was lay them out on the roof and finalize the position I wanted them to be in. They fit great at the rear of the roof, as I planned, and still allowed me room to get to the front of the roof. I watched the video from Gone with the Wynns and, since we also have a Fleetwood Bounder like they did, I took wiring inspiration from their video. They routed the wires behind the fridge, cabinets, and finally into the storage bin where the inverter lives. I took this route as well, but wasn’t able to get the fridge out easily. 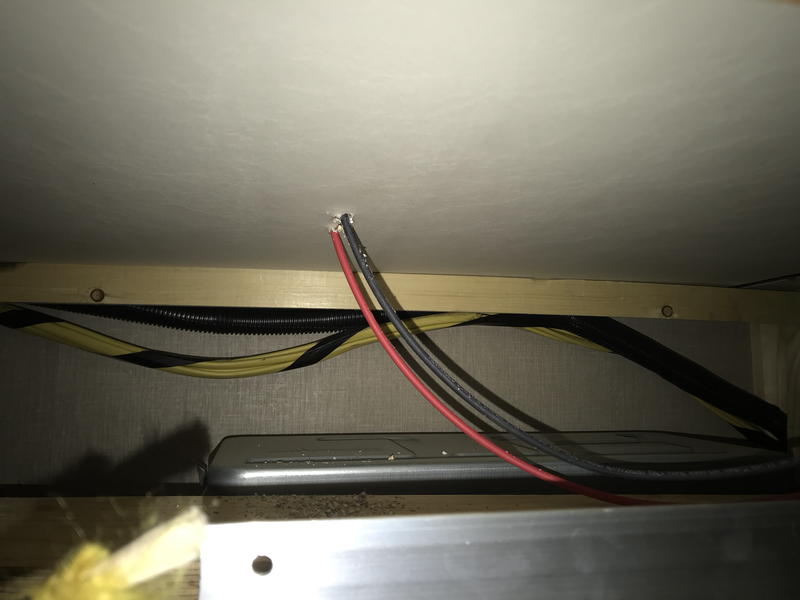 My workaround was to have the wires enter the RV above the fridge, then simply route the wires down the side of the fridge, fairly close to the front of the fridge. There was a gap in the floor the fridge sits on, and I was able to route the wires alongside a heating duct under the oven and behind the kitchen cabinets. 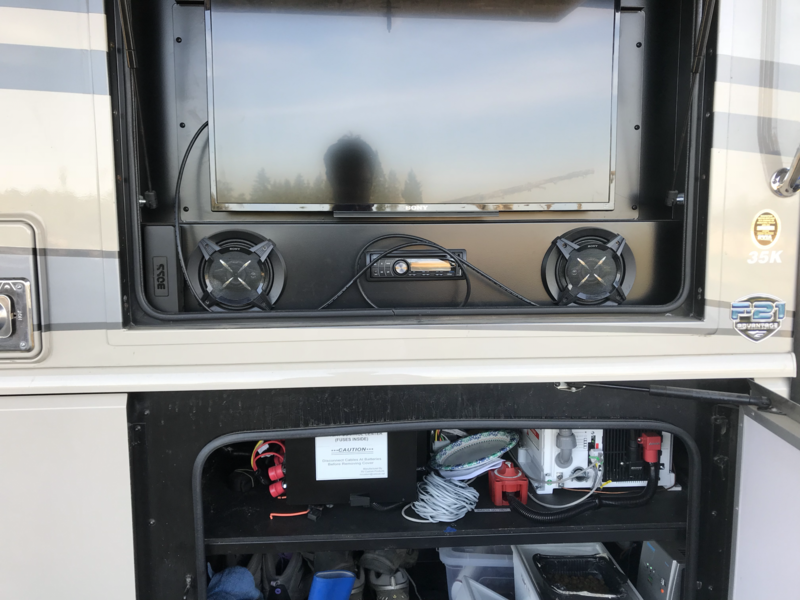 Once I had the wires behind the cabinet drawers, I saw the backside of our outdoor TV. 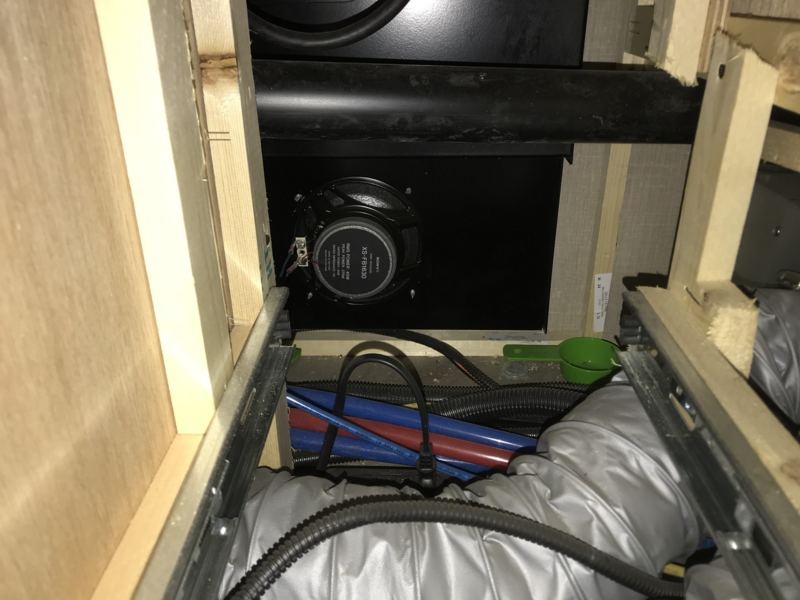 Using the speaker box as a reference point from both inside and outside the RV, I determined where to drill in order to access the storage box without damaging anything. A few drills later, I had successfully routed my cables into the final place. I bought tons of wiring, and knew I’d need to cut wires to make the project work. I purchased some MC4 connectors so that I could add them to the ends of my cut cables. This worked out really well, and was quite simple. I followed the instructions in this video for reference. 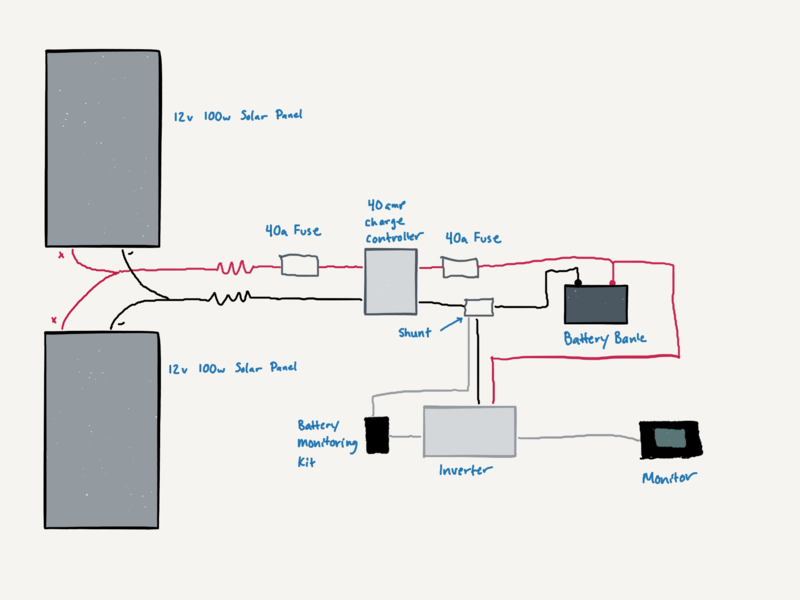 Once the main wires were in place and connected to the charge controller, I hooked up the solar panels. I’d left them disonnected from the system wires so I didn’t risk a shock. I wired them in parallel since the panels were 12v each and my system was 12v. Parallel wiring maintains voltage, but increases capacity (for batteries) or output in amps (for panels). The project took roughly 12 man hours to complete, which was spread out over a Friday evening and Saturday. My wife helped with some of the project, so I personally spent about 8 hours on the project. Much to my surprise, the project was completed without a single problem. I was trying to think about any project I’ve ever done that went this smoothly, particularly at this scale, and I can’t think of one. I think this is the result of adequate planning. We haven’t had the chance to test the panels in full sun. We finished them on an overcast day with smoke from forest fires adding additional coverage. So, for now, we’re plugged in to shore power at our family’s home. We’ll test production in a few days when we get out on the road again. Human being since 1985. Jeep owner since 2002. Husband since 2009. Father since 2011. Glasses wearer since 2012. Beard owner since 2014. 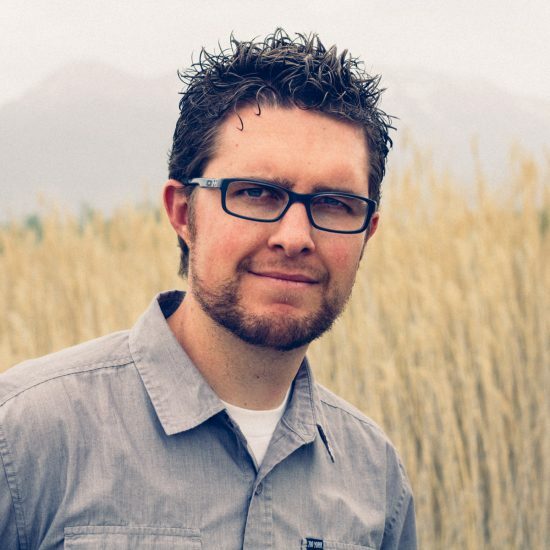 Website owner and contributor since 2017.